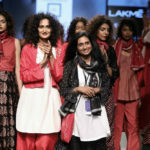 DAY 2- Lakme Fashion week 2017 presents “SUSTAINABLE FASHION" - Wedding Affair var admin_url = "https://weddingaffair.co.in/wp-admin/"
On the second day of Lakme Fashion Week Winter/Festive 2017, Sunita Shankar presented her collection “Beyond Tradition” in a somber palette of monochrome black and white, and eventually added a pop of color to her line by introducing other colors like crimson, burgundy and red. Shankar’s designs were a perfect combination of easy-everyday wear and formal wear. The collection boasted of the “In” dhoti-pants, halter jumpsuits, culottes and other clean-cut designs. In her collection, Sunita made extensive use of fabrics such as the delicate Chanderi silk, the famous Varanasi brocade, Bagh prints of Madhya Pradesh and West Bengal’s Kantha. The detailing in her work was carefully carried out with pin tucks and pleats. 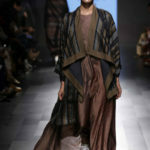 Gaurav Jai Gupta’s label “Akaaro” also showcased its “Irreverence” range on the second day of the Lakme Fashion week. It was not hard to decipher who Gupta had in mind while curating this collection as it is a perfect balance of modern-chic with just the right amount of ethnic-chic thrown into the mix. Gupta’s unconventional choice of fabrics gave everyone something to talk about. A flutter of silk, a dash of Ikat, and a blend of wool and khadi and wool and zari were amongst some of the materials that the designer had used to create this beautiful collection. Gupta’s ‘Irreverence’ collection for his brand ‘Akaaro’ was supported by the Australian Government Department of Foreign Affairs and Trade. If Anavila is a name that rings a bell for you, it’s probably because you heard it for the sheer beauty of her elegant linen sarees and asymmetrically designed but trendy ensembles. 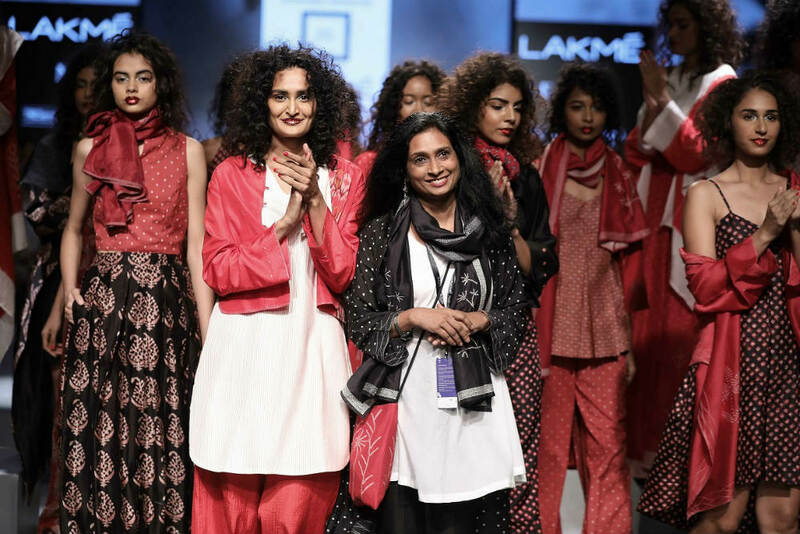 Anavila showcased her latest collection ‘Blur’ at Lakmé Fashion Week Winter/Festive 2017. While Anavila stuck to her love for loom linen, she also embraced other fabrics like silk, wool and khadi, which made the entire collection even more alluring. The color scheme throughout was maintained by the use of greys and blacks and a hint of navy blue thrown in here and there. “Blur” clearly had both consumers in mind – the one who are suckers for Indian wear and the ones who prefer Western wear. 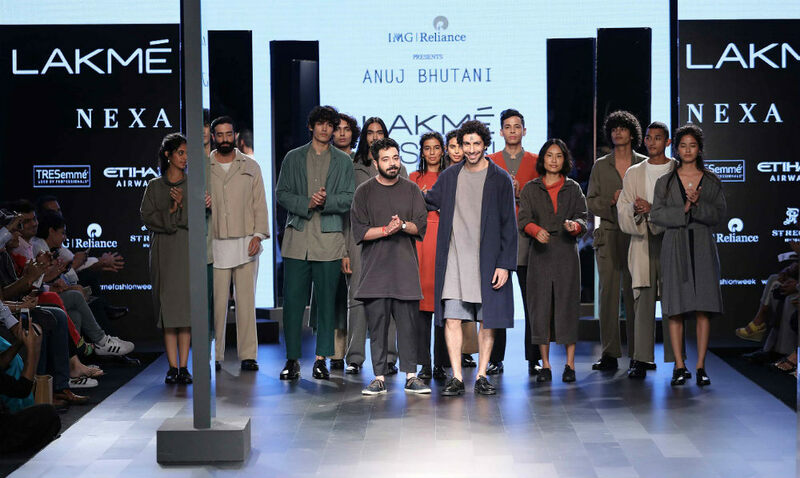 As “Sustainable Fashion” was at the heart of the second day of Lakme Fashion Week, “Khadi” emerged as the fabric of choice and quite possibly the fabric of the future as the day progressed. The fashion week hosted a grand installation as a tribute to Gandhiji and celebrated 100 years of the “Sattyagrah Movement”. As salutation to Gandhiji, Matr, Kopal NY and Because of Nature came together to showcase their collections which were made out of Khadi fabric. ‘MATR’, the brainchild of Praveen Chauhan and Akhilesh Kumar unveiled their collection “Bihar Khadi” at the fashion installation. The collection consisted of a variety of ensembles ranging from jackets to maxi dresses to crop tops with tassles. 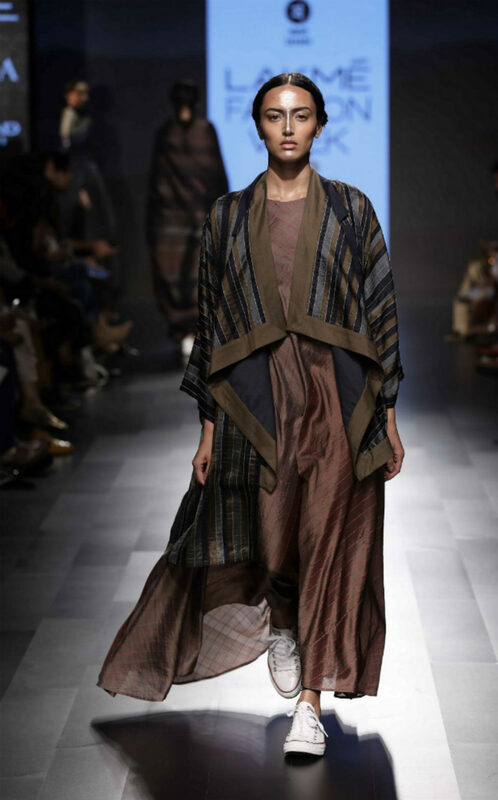 Likewise, Kopal, a graduate of the Fashion Institute of Technology, New York used Khadi of Matr for his collection. Kopal’s ensembles had clean linear cuts and the details were minimalistic. Organic brand ‘Because of Nature’, Australia by Kathy Williams also used Khadi by Matr for her designs which comprised of tidy dresses and over-sized jackets with detailing in their pockets. As the second day focused on “Sustainable Fashion”, it begged two important questions: Where do all the clothes that we discard eventually end up and can it be re-used as a new form of garment/accessory? IMG Reliance wanted to answer these questions by doing something and introduced the “Restart Fashion” campaign. It helped bring together designers and post-consumer fabric makers to re-invent a brand new collection. For the ‘Restart Fashion’ initiative, “Chola” label designer Sohaya Misra showcased his collection ‘One Love. One People. One Planet’ created with the ‘Recca’ fabric collaborating with Anandi Enterprises. “Recca” is the recycled cotton brand of Anandi Enterprises. Kimono-sleeve trench coats were the highlights of the collection along with draped dresses and long skirts. Converse India also teamed up with Kriti Tula of ‘Doodlage’ for her collection “Armchair Activism”. The collection used Converse India’s Upcycled plastic ‘Lifaffa’ fabrics to send out social messages using embroidery, patchwork and prints. The pencil dresses looked a class apart when teamed with cropped jackets and the pants looked both trendy and wearable. For over four decades Geetanjali Woollens have manufactured up-cycled yarns, fabrics, blankets and throws through sustainable means and practices. 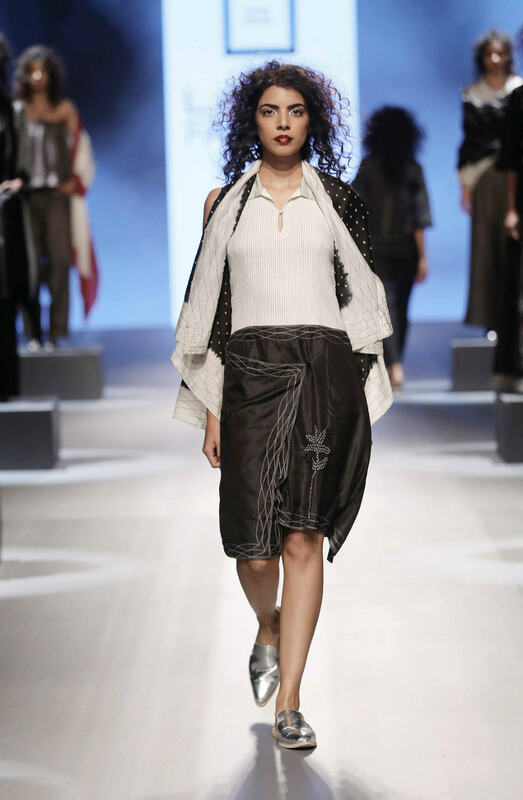 Anuj Bhutani used the fabrics from Geetanjali Woolens to curate a collection that would appeal to both the sexes. The color theme of his collection was a neutral one with hints of green and orange occasionally showing up. Jim Sarbh, famous for his not very unconventional Instagram posts and his award-winning role in “Neerja” strutted down the runway for Bhutani’s collections and was quite delight for the audience. LAKMÉ FASHION WEEK WINTER/FESTIVE 2017 opened its arms and gates wide open to the world yesterday (16th August, 2017) amidst the presence of the best designers and the biggest stars in the country. Designers Ritu Kumar, Sanjay Garg and Sonal Verma amongst others enthralled the audience with their out-of-the-world designs. Disha Patani and Sanya Malhotra showed the world just how to the stop the show in style and confidence. The dazzling Taiwan Lantern Festival!